First off, this is the best bang for your buck tenkara (or tenago) rod on the planet. Amazing tip flex action with enough back bone to put a whoopin' on some bigger subjects. 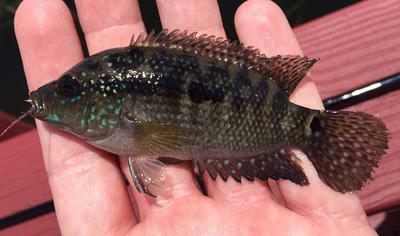 Caught a slew of bluegill, small tilapia, and one cichlidae species that I wasn't familiar with. The rig consisted of 6' of 4.0 line and 2.5 feet of 6x tippet down to a killer kebari. Had an awesome time with an awesome new rod that will now serve a key role in my pond and small stream tool box. Very nice! I have a Kiyotaki 18, I used it last year for micro fish, this year I'm using it for wild baby rainbow and brook trout. I have to agree that this rod is a crazy value. So light and compact, yet so fun to fish, and so cheap! I caught some small wild rainbows yesterday on mine.